It defines for fresh screed material the performance related to working time, consistency, pH value and for hardened screed material, compressive strength, flexural strength, wear resistance, surface hardness, resistance to uindentation, resistance to rolling wheel, shrinkage and swelling, modulus of elasticity and bond strength. It provides for the evaluation of conformity of the product to this draft European standard. The marking requirements for products covered by this draft European standard are included. This standard covers screed materials as defined in prEN 13318. This European Standard defines terms, which are used in the production and application of screed material and floor screeds. The terms are valid for all standards prepared by TC 303. This standard provides methods of calculation of heat transfer coefficients and heat flow rates for building elements in thermal contact with the ground, including slab‐on‐ground floors, suspended floors and basements. It applies to building elements, or parts of them, below a horizontal plane in the bounding walls of the building situated - at the level of the inside floor surface, for slab‐on‐ground floors, suspended floors and unheated basements; NOTE 1 In some cases, external dimension systems define the boundary at the lower surface of the floor slab. - at the level of the external ground surface, for heated basements. ISO 13370:2017 includes calculation of the steady‐state part of the heat transfer (the annual average rate of heat flow) and the part due to annual periodic variations in temperature (the seasonal variations of the heat flow rate about the annual average). These seasonal variations are obtained on a monthly basis and, except for the application to dynamic simulation programmes in Annex D, ISO 13370:2017 does not apply to shorter periods of time. NOTE 2 Table 1 in the Introduction shows the relative position of ISO 13370:2017 within the set of EPB standards in the context of the modular structure as set out in ISO 52000-1. This European Standard specifies the requirements for loose-fill expanded clay lightweight aggregate products for in-situ installation in roofs, ceilings, floors and ground floors. 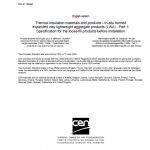 This Part 1 of the standard is a specification for the insulation products before installation. This Part 1 of the standard also describes the product characteristics and includes procedures for testing, marking and labelling. This standard does not specify the required level of a given property to be achieved by a product to demonstrate fitness for purpose in a particular application. The levels required for a given application are to be found in regulations or non-conflicting standards. This standard does not specify performance requirements for airborne sound insulation and for acoustic absorption applications.